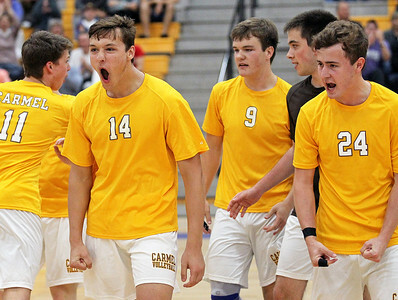 Candace H. Johnson-For Shaw Media Warren's boys volleyball team line up to greet Carmel at the net after they beat them 26-28, 25-20, 25-22 at Warren Township High School in Gurnee. Warren beat Carmel, 26-28, 25-20, 25-22. 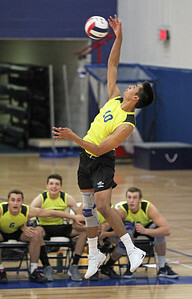 Candace H. Johnson-For Shaw Media Warren's Mihajlo Gomez makes an attack against Carmel's Ben Burkhalter and Mike Scott in the second game at Warren Township High School in Gurnee. Warren beat Carmel, 26-28, 25-20, 25-22. Candace H. Johnson-For Shaw Media Warren's Mihajlo Gomez serves against Carmel in the third game at Warren Township High School in Gurnee. 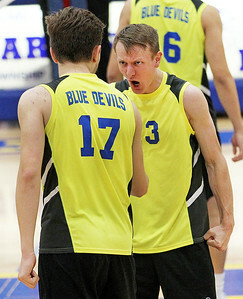 Warren beat Carmel, 26-28, 25-20, 25-22. Candace H. Johnson-For Shaw Media Warren's Kyle Wells makes an attack against Carmel's Ben Burkhalter and Mike Scott in the first game at Warren Township High School in Gurnee. Warren beat Carmel, 26-28, 25-20, 25-22. 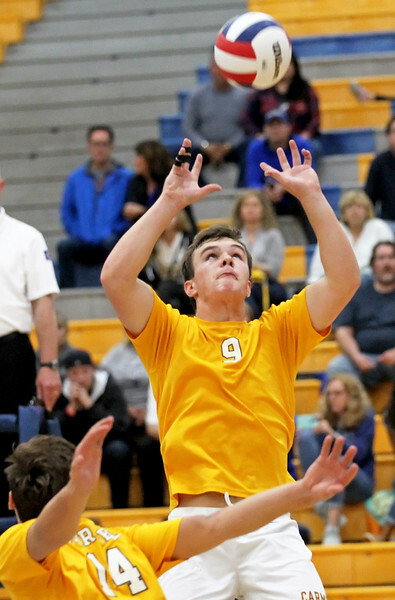 Candace H. Johnson-For Shaw Media Warren's Kyle Wells and Gavin Glickley celebrate a point against Carmel in the third game at Warren Township High School in Gurnee. Warren beat Carmel, 26-28, 25-20, 25-22. 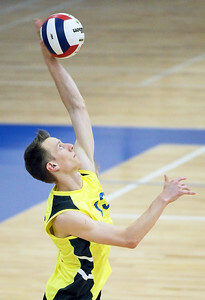 Candace H. Johnson-For Shaw Media Warren's Gavin Glickley serves against Carmel in the first game at Warren Township High School in Gurnee. Warren beat Carmel, 26-28, 25-20, 25-22. Candace H. Johnson-For Shaw Media Carmel's Ben Burkhalter bumps the ball against Warren in the third game at Warren Township High School in Gurnee. Warren beat Carmel, 26-28, 25-20, 25-22. Candace H. Johnson-For Shaw Media Carmel's Jack Herron sets the ball for Jimmy Harvey against Warren in the third game at Warren Township High School in Gurnee. Warren beat Carmel, 26-28, 25-20, 25-22. 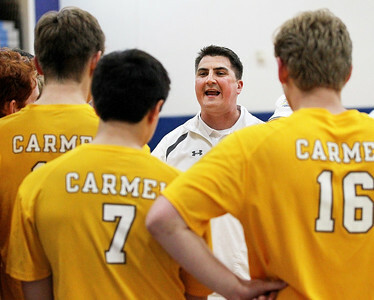 Candace H. Johnson-For Shaw Media Carmel's Kevin Nylen, head coach, talks with his boys volleyball team before their second game against Warren at Warren Township High School in Gurnee. Warren beat Carmel, 26-28, 25-20, 25-22. Candace H. Johnson-For Shaw Media Carmel's Jimmy Harvey (#14) and his teammates celebrate a point against Warren in the first game at Warren Township High School in Gurnee. Warren beat Carmel, 26-28, 25-20, 25-22. 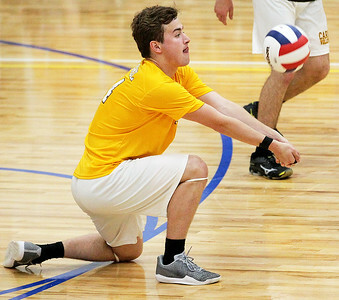 Carmel's Jack Herron sets the ball for Jimmy Harvey against Warren in the third game at Warren Township High School in Gurnee. 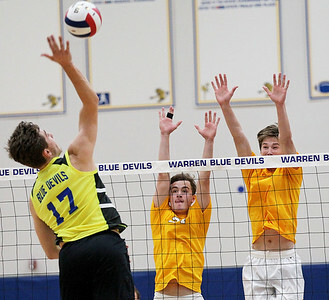 Warren beat Carmel, 26-28, 25-20, 25-22.